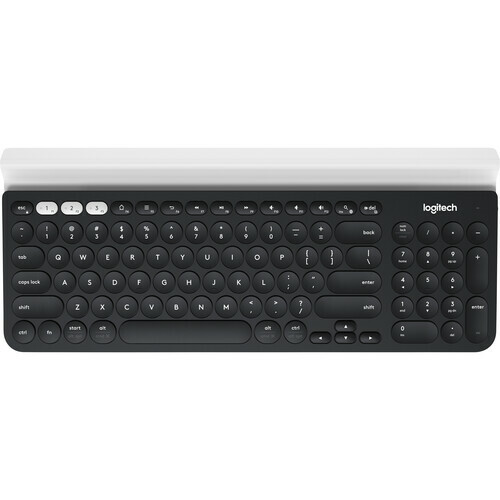 Wirelessly connect the Logitech K780 Keyboard to your Windows or Mac computer using Bluetooth Smart technology or via the included USB receiver. In addition to using this keyboard for your computer, you can place your favorite iOS or Android-based mobile device in the rubber cradle and switch between three devices using the Easy-Switch buttons. Regardless of how you use this keyboard, it features silent typing thanks to the Logitech PerfectStroke key system along with a dedicated number pad and a variety of shortcut keys. The Logitech K780 Keyboard is powered by two AAA batteries (included) and features a long battery life of up to two years for worry-free typing. Type a report on your computer, then type a message on your phone or tablet at the touch of an Easy-Switch button. Compatible with Windows, Mac, Android, and iOS (iPhone and iPad), this universal keyboard recognizes the type of device that's connected so that all the keys are exactly where you expect them to be. The Logitech PerfectStroke key system enables silent, smooth, and familiar typing. A solid build with large, carefully crafted concave keys, a convenient number pad, and all your favorite shortcut keys allows you to remain productive regardless of which device is being used. A wireless connection with 33-foot range and 128-bit AES encryption between the keyboard and the connected device keeps typing convenient, while remaining secure. Supports most smartphones and tablets with a thickness up to 0.44" / 11.3mm, in portrait or landscape mode. iPad Pro (12.9") in landscape mode only. The Logitech K780 features a long battery life of 24 months from two pre-installed AAA batteries, with auto-sleep, on/off button, and a battery status light. Furthermore, it comes with two options for wireless connection: the Logitech Unifying USB receiver or Bluetooth Smart technology. Box Dimensions (LxWxH) 15.5 x 6.5 x 1.3"
K780 Wireless Keyboard (Non-Speckled) is rated 4.0 out of 5 by 1. Rated 4 out of 5 by Robert from Just like described, great feel! This seems great so far, time will tell. Only drawback, it is not an illuminated keyboard. Other than that, seems top of the line. Add illumination and I will give you 6 stars.